Area: 728 sq km. Location: The Bendor Range is located east of the mining village of Bralorne and northeast of the Cadwallader Range. It is bounded on the west by the Hurley River, on the north by the Bridge River, east by Anderson Lake, and south by Cadwallader, Standard and McGillivray creeks. Terrain: The terrain is composed of high interconnected ridges featuring rocky peaks. Some of the mountains are composed of blocky granite and steep walls. The high valleys are covered in scree and flowery meadows with numerous small lakes. There are only a few pocket glaciers in the range as the climate is dryer than in the mountains to the west. The range is home to a large number of Grizzly bears. History: The Bendor Range remained virtually unexplored by non-natives until the end of the 19th Century when prospectors came though the region looking for gold that was believed to lie in the Bridge River headwaters. By the time the miners arrived, Chief Hunter Jack of Shalalth had already claimed the area as his own and is said to have been promised it as his personal domain during a visit by British Admiral Seymour in the 1870s. Hunters and prospectors in the valley had to pay their respects to Hunter Jack, if they were tolerated at all. He died around 1919 at Seton Lake under mysterious circumstances. During the gold fever in the surrounding region a new wave of prospectors roamed the area, which was barely shown on maps. First came came the placer miners and later spectacular gold deposits were found by hard rock miners. The Lorne-Pioneer mine was built in 1898 on the banks of Cadwallader Creek and Bralorne mine in the 1930s. The communities of Gold Bridge, Bralorne, and Brexton were founded. The mines kept producing until the 1970s. Most of the peaks in the range were probably first climbed by prospectors or hunters as very few mountaineers ventured into the area until the 1980s. There was, however, a solid amateur climbing/mountaineering community based out of Bralorne in the '30s, as mentioned in "The Great Years", a book by Lewis Green on the history of mining in the area, and also in a community history by Emma de Hullu, "Bridge River Gold". Bralorne had a mountaineering club in the '30s and '40s and also was the location of (AFAIK) the first downhill ski club in BC, with its tow and clubhouse on the flank of Sunshine Mountain (in the angle of Cadwallader and Noel Creeks). The name Bendor is a Scots-French hybrid meaning "mountains of gold" and is very apt given the number of gold strikes in the range. This name was given to one of the first claims in the Hurley-Cadwallader area but not for the obvious reason - Ben d'Or was a famous racehorse of the 1890s (horse-racing was the most popular sport in the period), so the equation between luck at the track and luck in prospecting seemed natural enough. Only the Cadwallader mines were truly profitable on a lage scale, though, despite some success at McGillivary Falls; other start-ups at McGillivary Pass, Truax Creek or Nosebag Mountain within the range were not viable. Other mines associated with the Bendor were at Wayside, Congress, Minto City and Greyrock, all along today's Carpenter Lake (Greyrock is the large bluff opposite the Gun Creek campground, which is near the site of Minto City; it is reachable by following the same road from Gold Bridge which branches up Truax Creek). 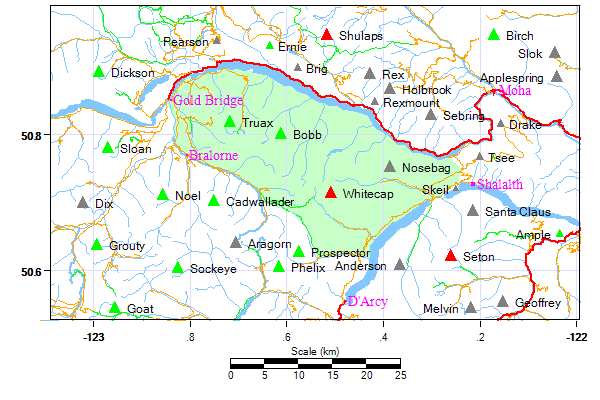 Among the many theories as to the location of Hunter Jack's lost nugget-motherlode is the valley of Whitecap Creek, but to this day no one's ever found anything approaching the bucketfuls of nuggets that Hunter Jack brought home to Shalalth after only a day's ride, either from Whitecap or Tyaughton Creek or across the lake from near Cayoosh Canyon.